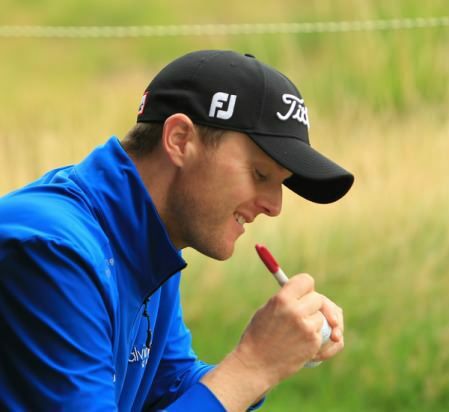 The 32-year old Ulsterman, winner of the Madeira Islands Open in May, looked destined for a weekend off when he followed a birdie at the 12th with double bogeys at the 13th and 15th and a triple bogey seven at the 18th. His outward 41 left him five strokes outside the projected cut mark on seven over par but he caught fire with six front nine birdies - at the first, second, third, fifth, sixth and ninth - to card a level par 71 and make it with a stroke to spare. It was classic stuff from Hoey, a mercurial player capable of sheer brilliance and maddening inconsistency in the space of only a few minutes. As for McGinley, the 44-year Dubliner followed an eagle three at the third with two birdies, two bogeys and a double bogey six to post a second successive 71 that left him 10 strokes behind leader James Morrison on level par. Praying for putts. Paul McGinley appeals to the man upstairs in the Open de France. Picture: Fran Caffrey/www.golffile.iePlaying on invitations thanks to his status as one of the tour’s top 40 career earners, McGinley has struggled this year but may well gain some confidence from his mature play over the first two rounds in France. Gareth Maybin looked certain to lead the Irish challenge when he reached the 18th at three under par for the tournament. But the Ballyclare man racked up a triple bogey seven to shoot 72 and share 33rd place with McGinley entering the last two rounds. However, Maybin became the second Irish player to fall foul of the rules at the 18th. Maybin and playing partner, Paul Broadhurst both found the bunker at the last, with Maybin quizzing the former Ryder Cup star if he could remove stones from the bunker. Broadhurst confirmed he could but when Maybin picked up what he thought was a stone, it crumbled in his hand. “I thought it was a stone but it turned out to be a hard piece of sand that broke up in my hand,” said Maybin. Maybin was three-under-par at the time, but before handing in his card he sought out chief referee, Andy McFee, a day after McFee had to inform Damien McGrane his action in taking a penalty drop at the same hole was illegal. Under the rules, McFee could do nothing but confirm the two-stroke penalty for Maybin to record a triple-bogey seven. Peter Lawrie’s 70 helped him make the cut on the two over par limit but it was another disappointing week for Darren Clarek and Shane Lowry. Clarke was undone by a bad back nine in a first round 75 and after going out in one over on Friday, he needed Hoey style fireworks on Le Golf National’s front nine but followed birdies at the first and third with a bogey at the seventh for a 71 that left him two shots outside the mark on four over. Lowry missed his third successive cut but his 69 meant he at least broke par for the first time in eight rounds - something he hasn’t done since he shot 67 in the final round of the BMW PGA at Wentworth more than a month ago to secure his card for next season. Morrison, 25, shot 66 for the second day on the trot to lead by a stroke from Australian left-hander Richard Green with fellow Englishman Mark Foster four shots off the pace on six under after two 68’s. The Irish Independent also reports that Clarke and Miguel Angel Jimenez are rumoured to be in line to captain the Vivendi Trophy sides in September. Considered a stepping strone to the Ryder Cup captaincy, the appointments will be annouced after the Open. Could this be the first sign that McGinley will could overlooked for the European captaincy at Gleneagles in 2014? Sweden's Peter Hanson holed in one to grab his place in in next month’s US Open but Irish hopefuls Gareth Maybin, Paul McGinley, Gary Murphy and Michael Hoey all failed to qualify at Walton Heath. Paul McGinley in action at the Parador de Malaga in the Open de Andalucia. Photo Eoin Clarke/Golffile 2011)Paul McGinley opened his Open de Andalucia account with a two under par 68 to lead the Irish charge with Ballyclare’s Gareth Maybin, three shots behind a quintet of leaders. It’s a good start for a man desperate to regain some form and while the prize fund is small, the Dubliner is grateful that he at least has the chance to play a tournament on European soil. Paul McGinley and his caddy, “Edinburgh” Jimmy Rae, line up his putt on the 18th green during the second round of the Open de Andalucia de Golf in Malaga. (Photo Eoin Clarke/Golffile 2011)Paul McGinley was the only Irish player to make the cut in the Open de Andalucia, which should come as no great surprise given the conditions.